If the Runner has four programs installed when they play Lean and Mean, then one of them is trashed during that run, do icebreakers then gain +2 strength? No. Lean and Mean checks the number of programs installed as the run is initiated, and if there are 3 or fewer programs installed at that time applies a constant effect during the run. If the Runner has three programs installed when they play Lean and Mean, then they use Clone Chip to install a fourth program, do icebreakers then lose the +2 strength? No. Lean and Mean checks the number of programs installed as the run is initiated. If the Runner installs an icebreaker during a run initiated by Lean and Mean, does the newly installed icebreaker gain the +2 strength? No. The effect applies when the Runner plays Lean and Mean, so it will only apply to icebreakers installed at that time. The problem with any card that requires you to make a run is that you can't use it in combination with a card that, well, requires you to make a run. Here's a rough list of cards that make you run. You'll notice that it contains a lot of powerful cards. These are cards you cannot use in combination with Lean and Mean. 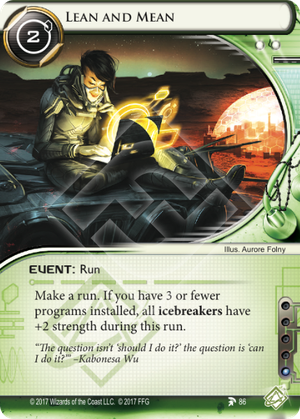 To make matters worse an icebreaker strength booster card like Lean and Mean is a tool for the runs that matter. But guess what, those are often the big multi-access runs initiated by things like The Maker's Eye or a board state altering run using cutlery like Knifed. About the only time that you make a run that both matters enough to spend extra credits on it and isn't started by a run event or ability itself is when you run on a scoring server. And yes, in such a situation Lean and Mean can save you a few credits, potentially making the difference between win and loss. And ok, Lean and Mean is slightly better than saving a few credits. Since it boosts ice breakers it can be used to make fixed strength breakers like Yog.0 work on heavier ice. Because it's an event that's not a trick you can pull off a lot though. The major downside of Lean and Mean is that you can't have more than 3 programs installed. That means you need to run with either an AI setup or a classic three breaker setup and no support programs. Still, plenty of decks do that. I would recommend however just skipping Lean and Mean if you're worried about needing more than 3 programs, in all likelihood that extra program will have more effect than Lean and Mean. So how much does 2 strength per icebreaker gain you? If we rate the cost of boosting an icebreaker at 1 per strength 2 strength wins you at most 2 times the number of ice in front of the targeted server in credits. If an icebreaker doesn't need the full 2 extra strength the savings go down, if an icebreaker needs more than 1 per strength the savings go up. But as a rule of thumb 2 times ice is good enough. In my experience the really interesting servers have 3 pieces of ice. So 6 gross savings, 2 cost leaves 4 net savings. Certainly not bad. Err, but wasn't there a card that gives you 4? Sure Gamble or something? I don't think the credit savings argument is going to work well. Let's try the pumping fixed strength breakers argument. Oh? Nobody plays those anymore? Injection Attack is cheaper? The Personal Touch works better in the longer run? The question is not "should I do it? ", it's not "can I do it? ", it's "do I want to do it?". And my answer is no. If this card had no restriction on installed programs, cost 0 and gave each breaker +4 strength I still wouldn't play it. As Silv says, you can't play this if you're Deep Data Mining, or doing anything else interesting on the run. 99% of the time you're better off running a standard econ card. Security Chip is 0, gives a minimum of +2 to each breaker, doesn't have the restriction and crucially can be triggered after an ice is rezzed and I STILL never play it in my Sunny decks. I don't know why FFG keep printing things like this and Pushing the Envelope and Injection Attack. They just don't do enough to justify the card slot. Maybe, MAYBE with all the difficult to boost breakers like the conspiracy breakers, Na'Not'K, etc. No, who am I kidding.